THE sheer scale of devastation wrought by two years of rainfall compressed into two weeks in north western Queensland is growing by the day, as some with strong knowledge of the northern industry suggest estimates of even 300,000 cattle lost may yet prove to be conservative. 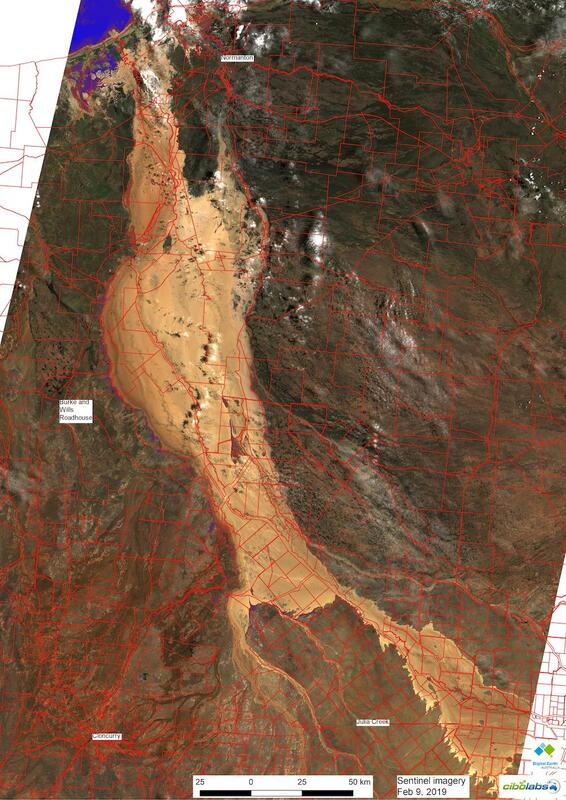 These satellite images were captured by Cibo Labs (www.cibolabs.com.au) over the devastated areas from Julia Creek, Cloncurry and out to the Gulf on Saturday, Feb 9. 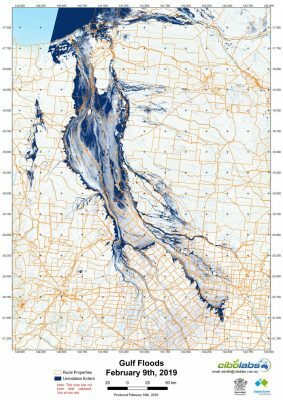 At its widest point the flood is more than 75km across. CiboLab’s managing director Phil Tickle said a quick analysis suggests that yesterday there was more than 20,000 square km under water. Property boundaries (red lines) are overlayed to provide a sense of how many properties are inundated. See associated inundation map below. It will take some months for actual losses to be verified, and the final number may never truly be known as it will include countless calves yet to have been branded and added to herd records. However, it seems clearer with every passing day that the sheer scale of this disaster is unparalleled. Apart from some of Australia’s biggest ever droughts which have stretched over years and covered vast tracts of the continent, we can find no record of any previous one-off natural disaster in Australia that has caused anywhere close to the destruction of so many cattle so quickly. Cloncurry livestock agent Peter Dowling said with more than 2 million cattle in the Gulf and potentially 1.5 million cattle in the area affected by floods and recent high winds and cold weather exposure, there is potential for losses to be even greater than the 300,000 estimate so far bandied around. Flood inundation map from CiboLabs. Click on image to enlarge. He has been on the phone constantly to cattle producing clients throughout the region and said on average people are reporting losses of 80 percent of their herds. The focus is now on trying to keep the 20 percent remaining alive and to get them feed before they starve, but that effort continues to be frustrated by remaining water that is preventing access. He said nothing had compared to the loss of cattle experienced during this event, and the flow-on affects were likely to be felt industry-wide. The sudden removal of potentially hundreds of thousands of breeding females from the region would mean less bulls to be sold into the region this year, less demand for transport operators who in turn would spend less on tyres and fuel, and properties with fewer cattle would no longer be able to employ the same number of people. “It threatens the whole structure of the community,” he said. “The whole industry is going to feel this. Mr Dowling said affected property owners were sticking their chin out and saying they will carry on, but it was clear people were doing it tough. “There is probably shock at the moment,” he said. “When you start walking around, if you can walk around your country, a lot of people obviously can’t yet, but for those that could get in the car, as you have seen no doubt on Faceobok and seen some of the horrific pictures, it leaves your head in a pretty bad space. Mr Dowling said affected communities are today asking the Prime Minister to appoint a disaster relief coordinator to do a similar job to that done by General Peter Cosgove in the aftermath of Cyclone Yasi. “Someone needs to go in there and structure this because there are shortages of everything, it needs some organisation. In the meantime registered charity the Sisters of the North has established a Go Fund Me page to take donations to help familes affected by the NW Qld floods. $39,000 had been raised in the 48 hours since the page was established. Mr Dowling said he had been humbled by the level of support coming from outside the region. “I’m getting calls from a lot of mates down as far as Dubbo that are saying tell us when, we’ll get up there. In a significant and rarely seen move in such circumstances, the Federal Government and State Government on Friday increased grants for flood affected primary producers from $25,000 to $75,000. The money is available to farmers in nine local shires, and can be used for purposes including hiring and leasing of equipment, purchasing fodder, salvaging feed or crops and repairing essential plant and equipment, with payment provided on presentation of invoices. Fodder and fuel drops are also now well underway. The Queensland Government has announced an independent review of the circumstances surrounding the flood event, including levels of preparedness and the response, including measures taken to inform the community and protect life and property. The review is expected to be completed mid-year. The Commonwealth Government is also contributing $3 million to bolster mental health services on the ground. Prime Minister Scott Morrison described the images of hundreds of dead cattle in western Queensland floodwaters as “heartbreaking’. AgForce CEO Michael Guerin this afternoon said the floods had caused a massive humanitarian crisis that had devastated an area twice the size of Victoria. While it would take time to confirm full losses, it was certain the industry “will take decades to recover” he said. So far, more than 100 producers had requested fodder to try to save more than 150,000 head of cattle. “I implore governments of all levels, as well as other agencies involved in this mammoth undertaking, to put aside red tape, bureaucratic wrangling and patch protection, and understand the desperate situation of so many producers. “Even as we work through the logistical issues to get fodder to cattle with the assistance of the defence force and local volunteers – helicopter pilots, truckies, townies – we need to be deploying specialist well-being professionals in. He said the Royal Flying Doctor Service Mental Health team was now on hand providing support. Northern region Cattle Council of Australia independent director David Hill, whose family endured a destructive flood on their Central Queensland property in 2017, said assistance from others will be crucial to the northern recovery effort in coming weeks and months. The thing he remembers the most about their experience two years ago, which caused about $1 million of damage to their property and infrastructure, was the kindness, generosity and support of others following the event, including volunteers from the Aussie Helpers group. He said ensuring aviation gas was readily available for the army of privately owned choppers currently trying to help flood affected northern producers would also be vital. “Those fellas with their Robos (Robinson R22 and R44 helicopters) are a godsend, he said. “Here they helped us to swim cattle, they got cattle to higher ground. “We had a network of people that donated things to us. We have a lot of good friends who were able to lend us gear to put fences back up and we had people donate posts and barb. “Compared to what they’re going through (up north) ours was really an afternoon shower. “I really feel for them. It is just the logistics of it, the enormity of the task that is facing some of these people now. “The biggest thing is to ensure those local fellas with the local knowledge can run those machines at minimal cost to everyone, that is where the donations need to be. It must be noted from the outset that a disaster plan will only be temporary unless the long term aspect of ongoing funding for rehabilitation is set in concrete through government legislation. Long term, low cost funding must generally be available for rebuilding infrastructure, restocking of breeding herds, retention and support of country towns and businesses etc, etc. After natural disasters of days gone by and as time elapsed, so often the hardship and community suffering lives on, unnoticed by those not affected. We witnessed this after flash flooding of Toowoomba CBD and the Lockyer Valley but we spent $20 Million on a useless flood enquiry. Furthermore, the current natural disaster of NQ is unparalleled in terms of magnitude. The map shows the vast extent of the flood waters. What is not shown or yet known is the huge number of cattle beyond this area that succumbed to exposure from prolonged cold rain and wind. It is indeed an unprecedented catastrophe.